Dupree, Nancy. 85-124. Dupree Collection, Williams Afghan Media Project, Williams College, Williamstown, MA. Folio from an Unidentified Text; The Angel Israfil. 1580-90. Freer Gallery of Art / Arthur M. Sackler Gallery, Washington, DC. In Freer Gallery of Art / Arthur M. Sackler Gallery. http://www.asia.si.edu/collections/singleObject.cfm?ObjectNumber=S1986.219. G-00209-12. AMRC Collection, Williams Afghan Media Project, Williams College, Williamstown, MA. G-00209-14. AMRC Collection, Williams Afghan Media Project, Williams College, Williamstown, MA. G-00209-15. AMRC Collection, Williams Afghan Media Project, Williams College, Williamstown, MA. ISAF. "Sharing Smiles." Digital image. Isafmedia's Flickr Photostream. Accessed September 5, 2010. http://www.flickr.com/photos/isafmedia/4251620972/. KES-763-A-162. Khalilullah Enayat Seraj Collection, Williams Afghan Media Project, Williams College, Williamstown, MA. The Makhzan Al-asrar (Treasury of Secrets) by Mawlana Haydar. 1577-78. Freer Gallery of Art / Arthur M. Sackler Gallery, Washington, DC. In Freer Gallery of Art / Arthur M. Sackler Gallery. Accessed September 5, 2010. http://www.asia.si.edu/collections/singleObject.cfm?ObjectNumber=S1986.54. Muj_around_fire. AMRC Collection, Williams Afghan Media Project, Williams College, Williamstown, MA. Omar, Mohammad, performer. "Tabla Solo in the Rhythmic Cycle of Jhaptal (10-beat Cycle)." In Ustad Mohammad Omar: Virtuoso from Afghanistan. Smithsonian Folkways, 2002, CD. Rich, Sebastien, UNICEF, and UNAMA. "Photo of the Day: 5 March 2009." Digital image. UNAMA's Flickr Photostream. Accessed September 5, 2010. http://www.flickr.com/photos/unama/3329763851/. Sl-04715. AMRC Collection, Williams Afghan Media Project, Williams College, Williamstown, MA. Afghans are connected to their past primarily through stories. It’s very much a storytelling culture. It’s hard to overemphasize the importance of storytelling in Afghanistan and the extent to which it pervades all levels of society. But in a country where only 28% of the people can read, storytelling is especially important for conveying information and for teaching the values of the society to a new generation. It’s an oral culture more than a visual culture, even more than it’s a musical culture, although music is also important in parts of the country. But stories are the main lynchpin for understanding, not only the past but also the present. Stories also bring entertainment, and they work to contextualize the daily struggles of individuals within a lighter world: Afghans, for example, have a wonderful sense of humor and lots of their stories are funny stories some of them are bawdy, a little bit racy. And they find ways to entertain themselves through stories. Think about those long winter months. And Afghanistan is a cold country. Parts of it, at least, are cold during the winter, and there are long periods when people stay inside. And they find ways to entertain themselves and they have to do it themselves. There are no iPods, no DVD players. People were dependent upon the entertainment that they could provide for themselves. In a culture without much access to digital media, storytelling continues to play an important role today—for communicating with people within the culture and also for communicating with people outside of the culture. While storytelling can be used to make individuals feel less alone in their struggles, it can also be used to give examples of exceptional figures. 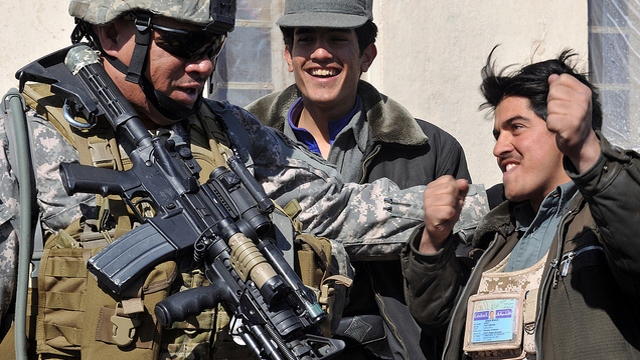 In the case of Afghanistan, these exceptional figures remind the faithful of the power of God. In the case of Islam, one of the things that I noticed was that people, when they talked about great leaders of the past, great figures, great Islamic figures of the past, they told me about them by telling me about the miracles that they performed in the past. It struck me that miracle stories themselves were important in capturing how these, you might call traditional Afghans, viewed the importance, the role of Islamic figures, a particular genre of Islamic figures, the Sufi leaders, the mystical figures of the past. That they told stories about the miracles that they had performed. And those miracles themselves were interesting because within those stories you found the kinds of potency, the kinds of power that was associated with Islam, and all of that potency and power ultimately derived from God and from an understanding of God’s role and his status as creator, and the ultimate source of all power in the universe. And these individuals were viewed as founts of that power, or vehicles of that power, expressions of that power. Storytelling gives Afghans hope that they are not alone, that this trail has been blazed before by both common and exceptional figures. The power of storytelling lies in its ability to be a reminder of both the greatness and the universality of their struggles. Afghanistan has a storytelling culture: it connects Afghans to their past and to one another. Among other things, stories remind people of both the greatness and the universality of their struggles.